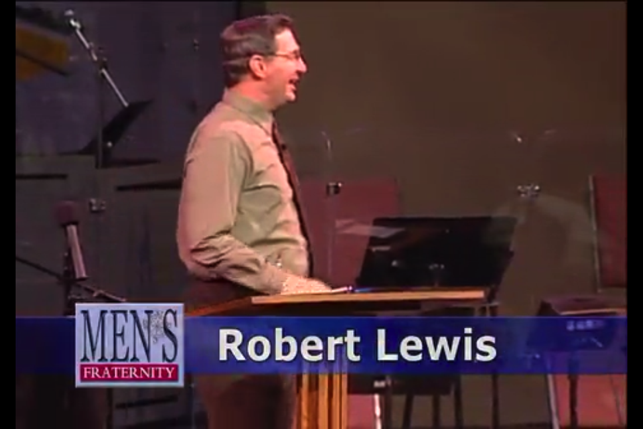 Men’s Fraternity Classic is the original Authentic Manhood curriculum developed by Dr. Robert Lewis. 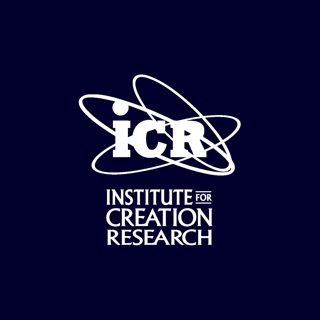 The world’s most popular curriculum on manhood is now available as an innovative iPad experience. Enjoy and learn from these timeless biblical truths 24/7 wherever, any time, any place. It’s easy to interact with the most popular manhood study out there. 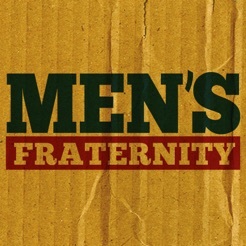 “The Quest for Authentic Manhood” is the foundational level of the Men’s Fraternity classic curriculum. You will be able to enjoy 24-sessions focused on a man’s core identity and dig deep into basic manhood issues. “Winning at Work and Home” is the second installment in the Men’s Fraternity Classic series. This 16-session study focuses on the two areas that are central to a man’s life: his career and family. “The Great Adventure” is the third installment in the Men’s Fraternity Classic series. This 20 session series helps men create a clear and exciting vision for being the man God created him to be. E-Training Guide: The first session of each series is free! The rest of the workbook is available for purchase inside the app. You can personalize your study by adding notes, bookmarks, answering questions, and filling in the blanks. 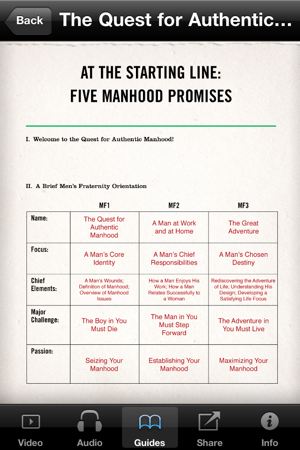 This will become your personalized manhood playbook. Media: A promotional/instructional video, one session of the downloadable video and one session of downloadable audio. Additional video and audio sessions are available for purchase inside the app. Videos can be viewed in landscape mode, along with the workbook or full screen mode. 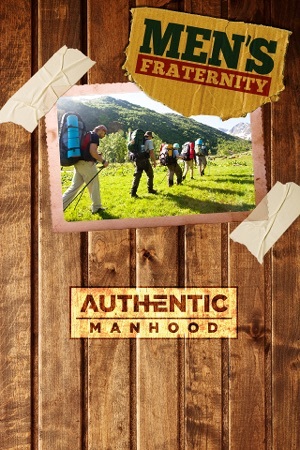 Access to purchase additional Authentic Manhood resources for the iPad as they become available. 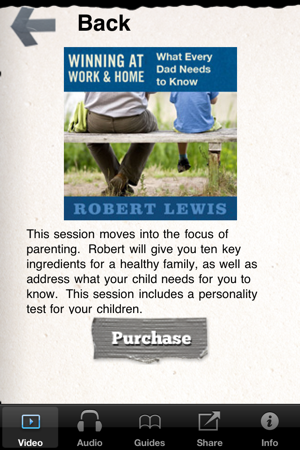 Join Robert Lewis on this unique and exciting journey to authentic manhood by experiencing each challenging session for yourself! Thanks for all the great feedback from our users! We heard you and have made some awesome changes. Added pinch and zoom functionality across all workbooks on iphone and ipad. This allows you to get a detailed look at all the workbooks and diagrams. Additional stability updates to help the app manage the over 100 hours of content and 350 pages of workbooks inside the app. I purchased the full Men's fraternity Quest for Authentic Manhood guide and enjoyed it until I had to reset my device. Now it is stating I need to buy it again. That is not right at all. I will not buy any more of the guides since they do not keep a record that I already purchased it in case I need to wipe my iPad again for any reason. Follow up! I just talked to their support and verified the information. If you purchase it again, it will state you already purchased it and not bill you! 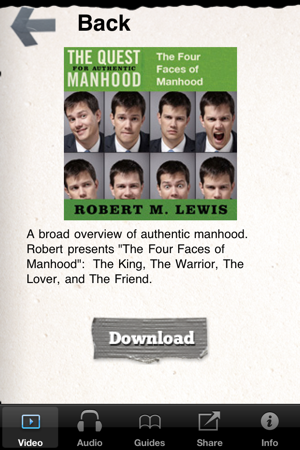 I purchased four faces of manhood in the app, and it completed the purchase and shows the play button but the content can never play. I think the app should be removed from the App Store until these issues are resolved, otherwise many will be losing money with no delivery of the purchased content, sadly. Also contacted support customer support who directed me to apple for a refund - so trying that route. I like the app idea - just disappointed it doesn't work. Thank you for the app, the only problem is that the product support does not exists. I bought a new iPad and was not able to transfer my manual to the new iPad. Requires iOS 3.2.2 or later. Compatible with iPhone 3GS, iPhone 4, iPhone 4s, iPhone 5, iPhone 5c, iPhone 5s, iPhone 6, iPhone 6 Plus, iPhone 6s, iPhone 6s Plus, iPhone SE, iPhone 7, iPhone 7 Plus, iPhone 8, iPhone 8 Plus, iPhone X, iPhone XS, iPhone XS Max, iPhone XR, iPad, iPod touch (3rd generation), iPod touch (4th generation), iPod touch (5th generation), and iPod touch (6th generation).